Foreign-born residents like me make up only 7% of Scotland's population. A strong majority of Scots think 7% is more than enough. Ach, nae more sassenachs! Sassenachs — better known as the English — are bad enough. But it's the other foreigners that are really drawing the ire of many Scots. Last week, the BBC extensively covered Scotland's views on immigration. Shaping its coverage around a March 2015 poll it commissioned, the "Beeb" to some extent manufactured this "news." Nonetheless, it is eye-opening to those of us who hail from distant lands. The BBC's poll found that 15% of Scots would prefer to halt all immigration. Another 49% want immigration reduced from current levels. Thus 64% of Scots support curbs and reductions on all folks from foreign lands. This from a nation which over centuries sent many millions of its own people out to emigrate elsewhere, a worldwide Scottish diaspora. Between 1915 and 1939 alone, roughly 2.3 million Scots departed as emigrants. 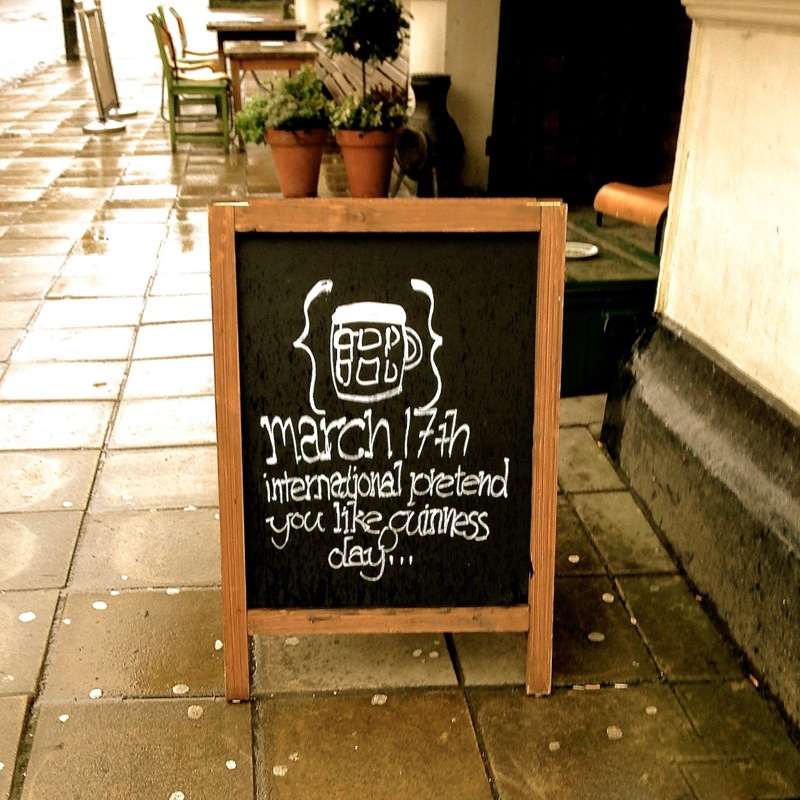 Some gentle Scottish ribbing of their Irish neighbors. St. Patrick, incidentally, was English and held for years as a slave in Ireland. After escaping, he later returned to Ireland as a missionary immigrant. 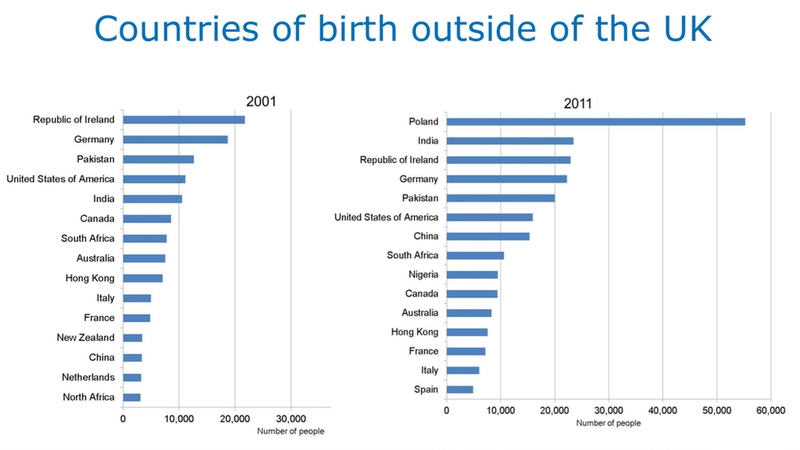 Currently, the largest numbers of immigrants to Scotland come from Poland. As of the 2011 census, the approximate total numbers of foreign-born residents living in Scotland included: 61,000 Poles; 54,000 Irish; 49,000 Pakistanis; 34,000 Chinese; 33,000 Indians; and 25,000 from African nations. Roughly 16,000 Americans lived in Scotland in 2011. The percentage of non-whites living in Scotland has doubled in the last decade or so, from 2% of the population in 2001 to 4% of the population in 2011. Nonetheless, Scotland remains ethnically homogenous — 84% of the overall population remains white Scots. Another 8% or so are whites from other parts of the U.K., and 4% are non-British whites. Furthermore, 58% of Scots believe employers should give preference to hiring British people over all other nationalities. Bear that in mind if you're looking for jobs here. 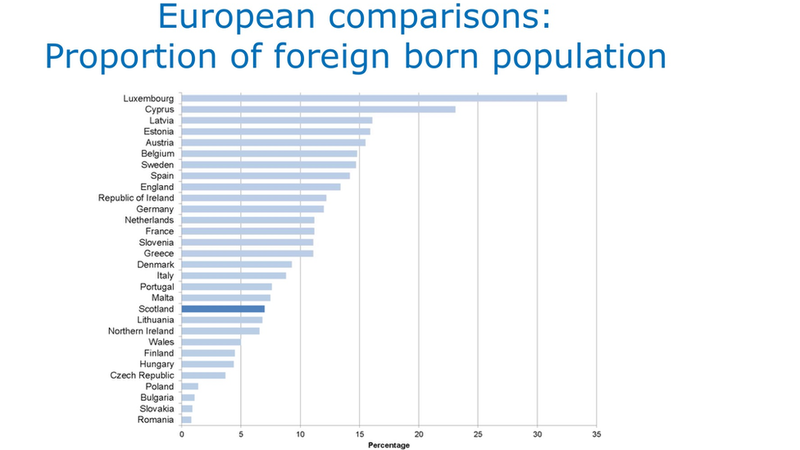 How does Scotland compare in its immigration profile? They're actually slightly more accepting of immigrants than other Britons. In a poll from last year, 70% of Great Britain believed that immigration should be reduced or halted entirely. While Scotland has 7% of its population foreign-born, similar to Northern Ireland (6%) and Wales (5%), in England the immigrants make up 13% of the population. Scotland has a net migration of 10,000 per year; England has a net migration of 300,000. As a foreign-born national, I don't encounter much animus. If any. Truly, I'm having a hard time thinking of anything other than a few sports-related jibes. My whiteness blends in easily here, and an American accent isn't all that unusual in Glasgow amongst its several universities. Throw in our highly educated and middle class backgrounds, and we aren't exactly the folks who most likely would feel the brunt of discrimination. So I was surprised by these poll results. I have found the Scots, in general, to be extremely welcoming and hospitable. Is my experience unlike that of other immigrants? Am I merely blind to animus I'm receiving? Are the Scots masking their dislike of me as an immigrant? Or do most just assume I am a tourist, and not an immigrant at all?